EPA Administrator Scott Pruitt testifying before Congressional committee. 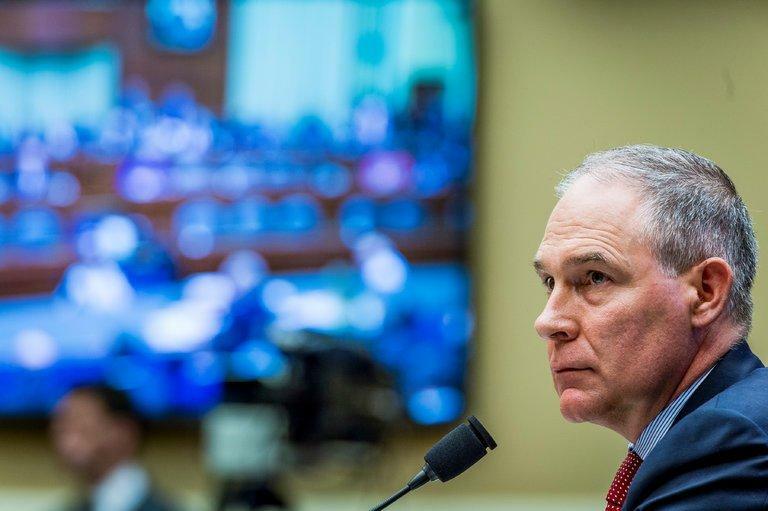 Last week, Environmental Protection Agency Administrator Scott Pruitt appeared before a U.S. House committee to answer questions about several scandals that have marked his administration. “Good morning, Administrator Pruitt, and welcome back to the environment subcommittee,” said Congressman John Shimkus, a Republican from Illinois, chairman of the Environment Subcommittee of the House Energy and Commerce Committee. Congressman John Sarbanes of Maryland, a Democrat, was among those who grilled the EPA Administrator. Pruitt is a former Oklahoma attorney general who works in close concert with his state’s oil and gas industry to roll back environmental regulations that impact that industry. The investigations include an inquiry into why Pruitt is not only eliminating public health protections and restricting the use of science – but also giving raises of 50 percent and 33 percent to his Oklahoma political appointees at EPA, using funds meant for the Safe Drinking Water Act. Pruitt also rented a DC townhouse from a lobbyist at a fraction of market rates and repeatedly flew first class back to Oklahoma on personal business while charging taxpayers, according to testimony from a Trump Administration official. Pruitt’s response was to blame his staff for some of the problems, and then try to make people confused about the whole notion of fact and fiction, news and fake news. Despite this professed desire for candor and openness, Pruitt refused to answer many of the factual questions posed to him. Many Republicans on the committee defended Pruitt, praising him for working rapidly to undo regulations that reduce the profitability of some businesses. Here’s U.S. Representative Joe Barton, a Republican from Texas. That last phrase by Barton was a telling one because rarely do lawmakers – or people, more broadly -- call clean air policies “radical.” But it was a sign of just how radical the Trump Administration and its allies in Congress have become. They are calling the pursuit of an obvious public good like clean air “radical” and defending to the hilt an EPA Administrator whose sole purpose is to dismantle the public agency he was hired to run.